Even Malta has its own Wetlands. It is probably not their most characteristic habitat, but it is important sanctuary or oasis for migrating birds or other faunal species dependant on water. But it is not just wetlands…there are cliffs, sand dunes or freshwater rockpools and no wonder that “local” animals must have a number of specific adaptations because of salt water fluctuation. 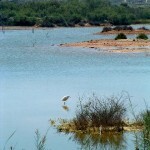 Saline marshlands and transitional coastal wetlands are two main meaning of “wetlands”. Their size varies depending on the climate. The Ghadira is probably the most famous and largest wetland where is the human’s footprint most suspicious. It lies between two hills, Marfa and Mellieha. This is the reason why rainwater leads down into the lake, but some parts are below sea level. It implies there is a mix of fresh and salt water. Actually, this area is a result of engineers, who was working here since 1980 and they did a great job. They finished their work here four years later and their main target was to cause a permanent residence of freshwater here. This area being opened to public since 1988 and there are a lot of things you can not see elsewhere on Malta. Good post. I study something tougher on completely different blogs everyday. It will always be stimulating to learn content from other writers and practice a little one thing from their store. I’d choose to make use of some with the content on my weblog whether or not you don’t mind. Natually I’ll provide you with a hyperlink on your internet blog. Thanks for sharing. Hi there very cool web site!! Man .. Excellent .. Superb .. I will bookmark your web site and take the feeds additionally…I’m satisfied to seek out numerous helpful information here in the post, we’d like work out extra techniques in this regard, thanks for sharing. You may could write next text speaking about this document. I will read further aspects of it!